#477 Tenebrae. – Laurel Mercantile Co.
Tenebrae (Latin for ‘shadows’ or ‘darkness’) is a Christian religious service celebrated by the Western Church on the evening before or early morning of Maundy Thursday, Good Friday, and Holy Saturday, which are the last three days of Holy Week. The distinctive ceremony of Tenebrae is the gradual extinguishing of candles while a series of readings and psalms are chanted or recited. In the Roman Rite of the Roman Catholic Church the Tenebrae readings and psalms are those of Matins andLauds. The Polish National Catholic Church and some churches within the Anglican Communion also observe Tenebrae. 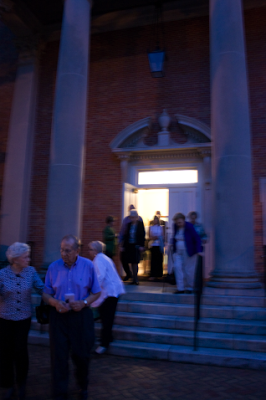 The name may also be used for various Holy Week services among Protestant churches. 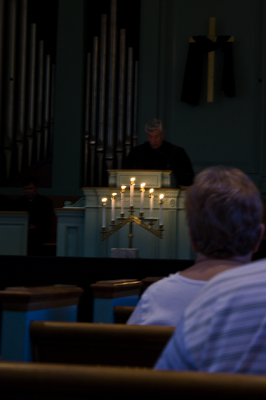 In short, it’s a very solemn, dark service of mourning and remembering the crucifixion. The church was silent when we came in, with very low light and 7 candles lit on the altar that was draped in black linens. 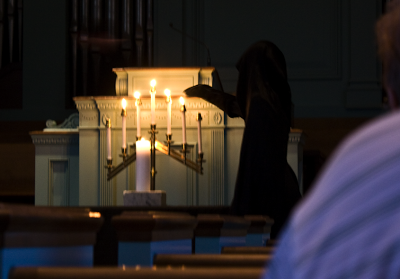 After a person dressed in black shrouds, “Death,” slowly carried in the Christ candle and placed it on the altar, there was beautiful chamber music by our choir director (his voice is so operatic it felt like we should have paid to hear it), hymns, and readings from John 18-19. After each group of verses on the betrayal, mockery, crucifixion and burial, Death would slowly extinguish a candle. 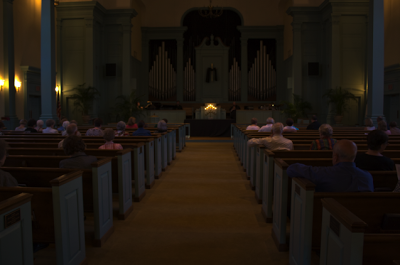 At the end of John 19, when Jesus is placed in the tomb, Death extinguishes the Christ candle, processes out in silence, and the sanctuary became totally dark. Then we all left in silence. To say it was moving is an understatement. For me, it meant Jesus’ death stopped being this distant historic event and became a very personal tragedy, the death of someone I know and love. It felt like it was happening right then, right there, on 5th Avenue in Laurel, Mississippi. My heart ached for this man who died, really and truly, for me and for you. If that doesn’t give you chills, then what could? #478 Egg hunt & the cookhouse sign.